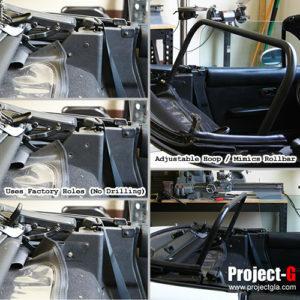 Exact replacement for factory assembly. These come as a set of 2. 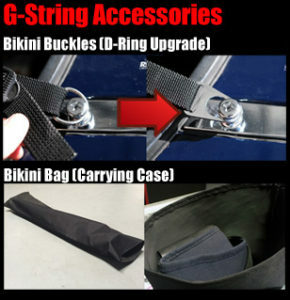 Adjustable hoop that mimics a rollbar for use with our G-String Bikini Top. 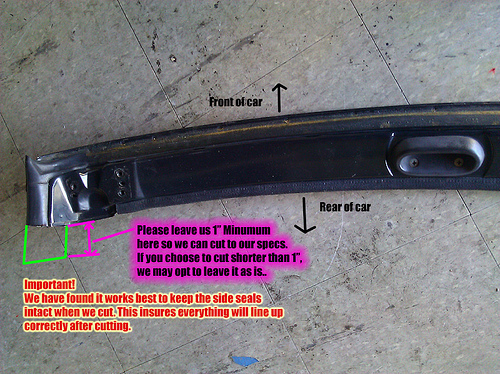 This is a great solution for anyone with extra cars, or if you wish to use it on a car without a rollbar. Sometimes, people can share a bikini top with the use of this bar. You can easily install a bikini top onto a friend’s car. The hoop installs in seconds. You can store the hoop behind the seats when not in use. 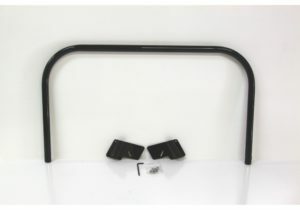 The bikini bar can mimic a rollbar/bikini top length from 26″ ~ 32″. Although it can mimic most measurements, 29″ is the most popular measurement. 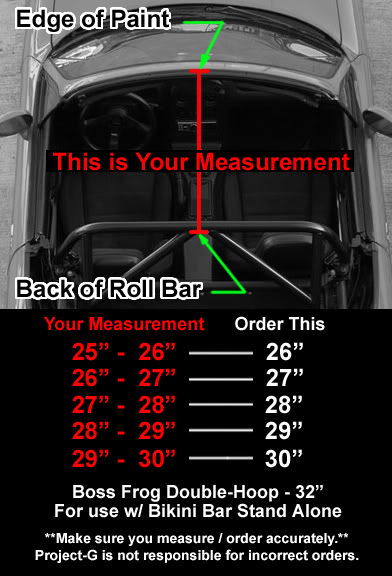 We recommend ordering that size (29″) if you don’t have a rollbar or any idea what to get. You will have the best chance of compatibility in terms of future use if you select it. Boss Frog Double Hoop customers all need to use 32″ to clear the double hoops. *IT IS EXTREMELY IMPORTANT YOU MEASURE CORRECTLY. DO NOT GUESS, MEASURE IT AND MEASURE IT AGAIN. This is an oem replacement air filter. Comes ready to use. REMEMBER! You air filter needs to be changed every 15,000 miles. Don’t forget at 30,000 miles to change plugs, air filter, and fuel filter. These are a great economically priced standard plug wire set. No frills, just OEM fitment. Standard Motor spark plug wire sets will provide your ignition system with new life. They are high-quality, direct-fit OEM replacement wire sets that are tailor-made to restore efficiency and performance. These sets are manufactured to OEM specifications and are preterminated, so they can be installed with no modifications. StopTech’s OEM Replacement Line is very affordable. Turning rotors is a thing of the past now. New rotors for just a little more is a great deal. We are glad we can bring these rotors to the community at such an awesome price. These rotors come blank(just like factory) but they at a much better price and value. C-Tek brake rotors and drums offer many of the features and benefits of premium replacement parts. • Double Disc Ground, Non-Directional Finishes. • Widest application coverage in the aftermarket. 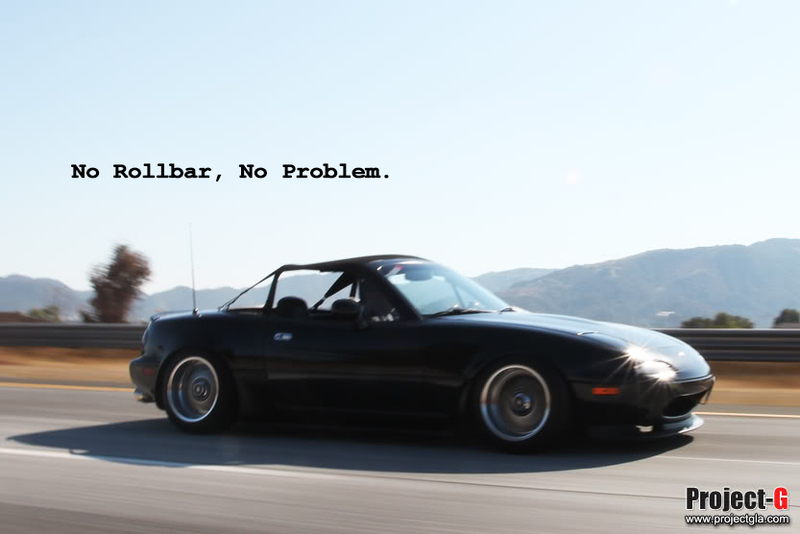 directly replaces a powered or non powered antenna in all Miatas from 90-05. Never have to worry about your antenna mast breaking off or snagging something again! This antenna is also powered to provide a superior reception upgrade to the stock one. It is extremely light weight in comparison to the heavy powered assembly. This inexpensive replacement antenna installs in seconds and gives your car an awesome look. Antenna/Power Wire Cable(long enough to reach your headunit/radio). So even if you do not have a wire harness on your car, this kit will give you everything necessary to add an antenna to your car. This is a replacement dual filament light bulb for your tail lights OR front turn signals on first generation Miata’s. Sometimes it’s hard to find this exact fitment at your local parts stores. This is a genuine Mazda part. As these cars get old, many of us(even seasoned mechanics) will break this delicate part. This aluminum piece cracks/breaks easy, especially if its old and has seen many mechanics in it’s day. A new thermostat cover is crucial part of your cooling system. Make sure to purchase a gasket too! Mazda has been using GATES for many parts inside the engine from the factory. Mazda GENUINE BELTS are actually Gates belts inside a Mazda package. The actual belt has GATES clearly printed on it. This kit is over a 75% price savings compared to ordering all these a la carte from Mazda direct. Skip the Mazda markup/middleman and get this affordable kit that comes with the same quality of parts. This timing belt kit is everything you need to replace your timing belt, pulleys and even the spring. It is recommended that you do your FRONT SERVICE all at once since you’ll have everything off anyways. Features Advantages: Tamper-evident packaging assures that all parts are in each box. Genuine Mazda Part: Check the part number with your vin. This is the fill plug(where you fill your trans fluid). This is for a MANUAL 5-Speed only! This is a universal fit item. For the front or rear of your car. Made from 5000kg load rated webbing, and with a steel plate to mount to the car (uses a 13mm mounting hole). TRS’ fabric tow loops are the original and still the best tow loops available. They have the strongest break strength, crucial when recovering cars from gravel traps, and utilise permanently dyed webbing for strong bold long lasting non-fade colours. 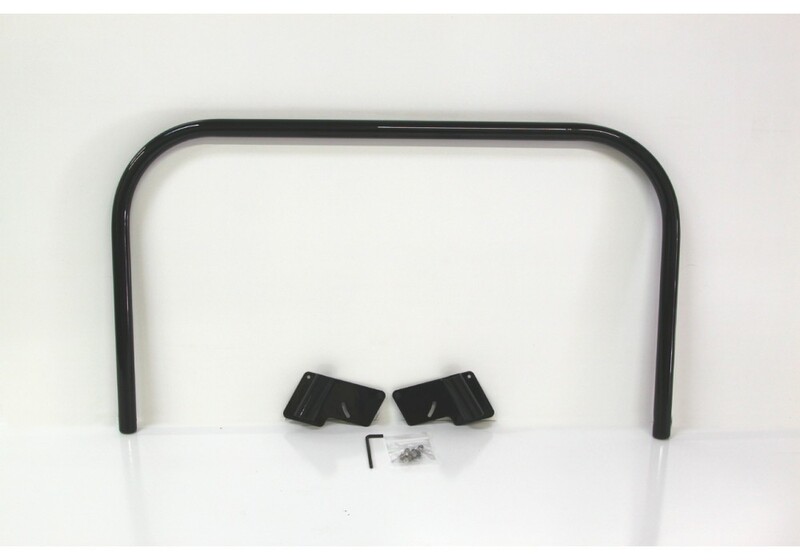 All tow loops are MSA compliant and are suitable for front or rear fitment to all car types. Overall length is 26cm, with a loop diameter of 13cm, the steel mounting plate bolt-hole centre ID is 12.5mm. Red, blue, black, yellow hi visibility and orange two loops are produced using 5000kg break strength webbing. Yellow, green, and silver tow loops utilise 3000kg webbing. Warning – web tow loops should be kept clear of hot exhausts. This true straight shot clutch line is vinyl sheathed braided stainless steel hosing from the same manufacturer as Stop Tech. We got these specially made to our specs for the Mazda Miata. Its the ONLY true straight shot clutch line. Check out the close up pictures and see the fittings go straight onto the clutch slave and master with NO NEED for more adapters or “customization” fittings. –You no longer need to fight the stock hard lines. -Elimination of multiple leak possibilities. 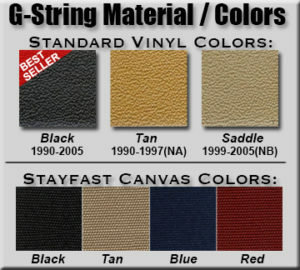 We offer: clear, red, charcoal, blue & green as color options. The Jass Performance Classic Racing Style Side Mirrors will install on MK1 or MK2/2.5 MX5. They not only look amazing, but perform well through good mirror position, optimized adjustability and convex glass for both sides. The mirrors are very lightweight. The supplied fitting kit consists of stainless steel security screws with security bit. Please note, some early MK1/NA models might not have the center hole and would need drilling it, in order to fit those mirrors. In case of doubt it is advisable to take off the OEM mirror and check before ordering. These interior mirror compliment the classic vintage look with its chrome finish. Exact bolt on fit on MK1 models with the mirror bolted on the upper windshield frame. Version for the later cars with mirror glued on the front windshield will follow in short. Comes with stainless fitting kit. – Full manual adjustability to top, bottom, left right. – Preserving the MOT/TÜV relevant el. height adjustability. – Do not add on weight to the OEM setup, due to lighter headlight units. They come with complete installation manual. The installation is built on the stock headlight frames and requires minor changes to them. We choose this adapter design, as it preserves all the MOT relevant features (stock kinematics, frame, height adjustment) and only adds E-certified headlights to allow MOT/TÜV registration of the package. Тhe headlights can be ordered on request with integrated sidelights.